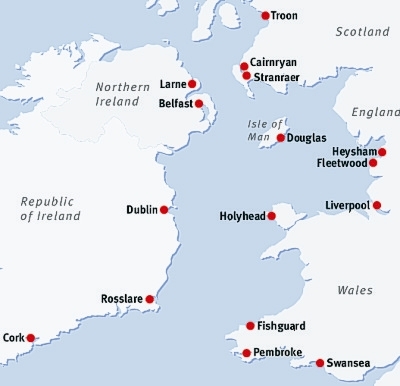 There are five major ferry ports in Ireland with direct sailings to Britain and France. All ferries are “Roll-on/roll-off” / “Car Ferries” that accommodate cars, motor-homes (RVs), caravans, buses, trucks, motorbikes, bicycles and regular foot passengers. There are a number of crossings during peak Summer service. The ferryport for Cork is at Ringaskiddy, about 30 minutes drive from Kinsale. We have listed all ferry connections here to aid journey planning but all except Cork are some distance from Kinsale (at least 3 hours driving time).